The Kohl's Facebook page is an excellent place to find a coupon code as they update it with new coupons several times per week. Be aware that most of the codes are good for 1-day only. They also post some cool pictures of new clothing along with ideas to coordinate items to create a new look. Also, if you shop regularly at Kohl's, follow them on Twitter as it's a great way to be kept in the know of new items, upcoming sales, and even the occasional Twitter exclusive coupon. Shopping online at Kohl's and can't find a coupon code anywhere? Simply use your smartphone and text SAVE07 to 56457 and get an instant coupon texted to you for 15% off your next Kohls.com purchase. To stop mobile sales alerts just text STOP to 56457. When shopping in-store at Kohl's, be sure to take advantage of the online kiosk. For example, let's say you're in the store trying-on clothing and find an outfit you love, but you didn't receive a 30% off Kohl's coupon via snail mail -- but you did find an online coupon code for 30% off your purchase. Just take the outfit up to a kiosk, scan it, and use the online code to score your 30 percent off. The kiosk will then mail the outfit for free to your home. Because the kiosk draws from a large online inventory, this Kohl's savings tip is particularly helpful if the store doesn't have your size. For more details on this tip and more, see our article 6 Kohl’s Shopping Secrets That’ll Change the Way You Shop. 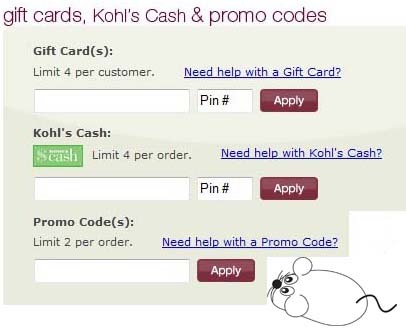 When shopping online, the most important thing you need to know is where to enter your Kohls coupon code when you are checking out. On the 'Payment Information' page you will want to enter your code in the 'Promo Code' box, then click 'Apply'. Make sure the coupon is accepted before you continue as it will be hard to get back to the payment information page. You can use a limit of 2 promo codes per order, which is great, as most stores will only let you use one. About Personal Creations: Personalized gifts is what these guys do best and they often give me coupons as well. About Sears: Brands like Craftsman, Kenmore, Diehard, and more at Sears.com. About Fossil: Really cool watches, shoes, and more. Plus they often have free shipping coupons. About Barnes & Noble: B&N.com could easily be your one stop for all your book and media needs.